Invisalign is an orthodontic treatment which uses clear, plastic, removable aligners to gradually reposition the teeth. This option is FDA approved and has been used in over 4 million cases worldwide. It is far and away the leader in clear braces treatments. Invisalign works thanks to customized aligners which are created according to the dentition of your bite at each stage of the treatment. You will receive your series of aligners and be instructed to wear each set for 1 to 2 weeks, depending on your specific needs. Make sure you have them in for 20 to 22 hours each day to avoid delays in treatment. The total length of the treatment will depend on the complexity of the case, but most last between 1 to 2 years. 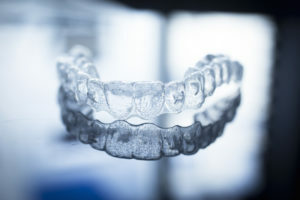 No, Invisalign does not hurt — and in many cases, it may even be more comfortable than fixed metal brackets and wires, which can cause blisters and sore spots. In fact, the only thing you are likely to feel is slight soreness as the teeth start to move into the proper position. That’s just progress! The cost of Invisalign varies depending on the complexity of the case. It is usually more expensive than conventional braces, but many people decide it’s worth it to avoid the hassle of visible metal hardware. In general, you can expect to pay an estimated cost of $4,000 for the Invisalign treatment. Q. Am I Eligible for Invisalign? Many patients who are interested in improving the alignment of their teeth but do not wish to wear braces can benefit from Invisalign. This treatment can be used to correct gapped teeth, crowded teeth, overbite, underbite, and crossbite. The most complex cases will still likely require treatment with conventional braces. The only way to know for sure whether or not you can successfully undergo Invisalign is to schedule an appointment with your Invisalign dentist. Don’t wait to do so — you deserve a beautiful smile with well-aligned teeth! Dr. Arindam Kakkar is a general dentist offering comprehensive dentistry services from the comfort of a state-of-the-art dental practice. He excels in cosmetic dentistry, offering Invisalign for patients who wish to straighten teeth without metal braces. To find out if Invisalign may be right for you, don’t delay in contacting your cosmetic dentist in Hackettstown! Give Dr. Kakkar a call at (215) 657-5255.